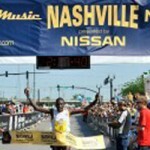 NASHVILLE, Tenn. – The rainy downpour soaked participants at the 14th St. Jude Country Music Marathon and Half Marathon presented by Nissan on Saturday, April 27, but spirits were still high as they crossed the finish line. 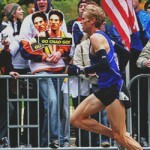 Scott Wietecha from Hendersonville, Tenn., won the men’s marathon in 2 hours, 22 minutes, 41 seconds, while Jill Horst from Rome, GA, landed first place woman in 2:57:52 – both champions were slated to run in the 2013 Boston Marathon but were unable due to overtraining and an illness, respectively. Nashville residents Daniel Lepage (1:10:39) and Gisela Olalde (1:19:58) captured the 12th edition half-marathon. 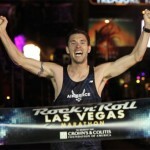 Marathon winner Wietecha is a teacher at HB Williams Elementary School. 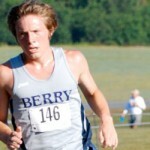 He encouraged 25 of his students to run at the ING KiDS ROCK Nashville race, taking place Sunday, April 28 at LP Field. Half-marathon runner-up Alan Ash from Atmore, AL (1:12:06), just finished track season at Vanderbilt and decided to participate in the race just yesterday. Runners toured some of the Music City’s most notable hot spots and attractions, while enthusiastic cheerleaders stood out in the rain to cheer on participants, along with thousands of spectators lining the course. The race started at Centennial Park, traveled through some of Nashville’s iconic locations such as Belmont University, the Tennessee State Capitol Building, Shelby Park and the Cumberland River, before finishing at LP Field, home of the Tennessee Titans. Biggest Loser winner Danni Allen ran her first half-marathon under her goal time, in 1:53:37. She ran with her trainer to support St. Jude Children’s Research, along with more than 2,500 St. Jude Heroes who raised incremental funds for the hospital by securing donations from family, friends and co-workers. St. Jude Children’s Research Hospital®, one of the world’s premier centers for the research and treatment of pediatric cancer and other deadly childhood diseases, is the title partner and official benefiting charity of the St. Jude Country Music Marathon. Funds raised for St. Jude are instrumental in supporting the $1.8 million per day it takes to run the hospital and allow families to never have to pay for the care their child receives. The hospital has played a pivotal role in pushing U.S. pediatric cancer survival rates from 20 to 80 percent overall. St. Jude Heroes earn special fundraising incentives, like a free race entry, lodging and airfare. Registered runners and anyone interested in donating can view the complete list of fundraising options and benefits at: http://fundraising.stjude.org. Country music star Craig Morgan and special guest, Sarah Darling, capped off the weekend of festivities with a post-race concert at the Nashville Municipal Auditorium at 7:00pm on Saturday, April 27.